To begin working out a direction on what to do and what to research I made a mind map on some of the rogue thoughts and ideas floating around my head. 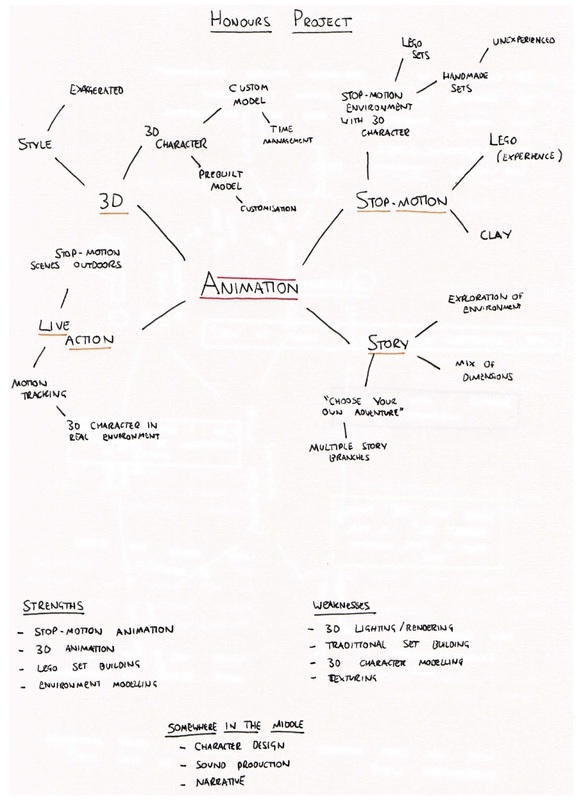 This mind map deals mostly with the medium of animation I want to work with and in doing so I hope to identify some mediums that can be combined or blended. I also wrote down some strengths and weaknesses I have to hopefully work out the best route to take this year. Obviously I want to play to my strengths as much as possible but also hopefully work on a few of my weaknesses. These are ideas that are more of “I wonder how I’d make that?” thoughts that have crossed my mind. I’m more than sure that I’ll look back on these ideas in the future and have different thoughts on them. I’m hoping that through research and practice I’ll form a better base for any research question and final product I’ll make.